Pseudomonas alcaligenes DIP1 produces an extracellular cyanophycinase (CphEal). The corresponding gene (cphE al ) was identified from subclones of a genomic DNA gene library by heterologously expressing the functionally active enzyme in Escherichia coli. The nucleotide sequence of the gene (1260 base pairs) was determined indicating a theoretical mass of 43.6 kDa (mature CphEal) plus a leader peptide of 2,6 kDa which corresponds well to the apparent molecular mass of 45 kDa as revealed by SDS-PAGE. The enzyme exhibited a high sequence identity of 91% with the extracellular cyanophycinase from P. anguilliseptica strain BI and carried an N-terminal Sec secretion signal peptide. Analysis of the amino acid sequence of cph E revealed a putative catalytic triad consisting of the serine motif GXSXG plus a histidine and a glutamate residue, suggesting a catalytic mechanism similar to serine-type proteases. The cyanophycinase (CphEal) was heterologously produced in two different E. coli strains (Top10 and BL21(DE3)) from two plasmid vectors (pBBR1MCS-4 and pET-23a(+)). The signal peptide of CphEal was cleaved in E. coli, suggesting active export of the protein at least to the periplasm. Substantial enzyme activity was also present in the culture supernatants. The extracellular cyanophycinase activities in E. coli were higher than activities in the wild type P. alcaligenes DIP1 in complex LB medium. Highest extracellular enzyme production was achieved with E. coli BL21(DE3) expressing CphEal from pBBR1MCS-4. Using M9 minimal medium was less effective, but the relatively low cost of mineral salt media makes these results important for the industrial-scale production of dipeptides from cyanophycin. Cyanophycin (cyanophycin granule polypeptide, CGP) is a naturally occurring poly(amino acid) that was first observed in cyanobacteria (Borzi 1887). It is accumulated in the early stationary growth phase (Mackerras et al. 1990; Liotenberg et al. 1996) and functions as storage compound for nitrogen, carbon, and energy (Elbahloul et al. 2005; Füser and Steinbüchel 2007). CGP consists of a poly(aspartic acid) backbone with arginine moieties linked to the β-carboxyl group of each aspartic acid by its α-amino group to form multi-L-arginyl-poly(L-aspartic acid) (Simon and Weathers 1976; Oppermann-Sanio and Steinbüchel 2003). CGP is accumulated intracellularly in the form of membraneless granules and is degraded by cells when growth is resumed (Allen and Weathers 1980). Most genera of cyanobacteria (Simon 1987; Allen 1988; Mackerras et al. 1990; Liotenberg et al. 1996; Wingard et al. 2002) and also some heterotrophic bacteria (Krehenbrink et al. 2002; Ziegler et al. 2002; Füser and Steinbüchel 2007) harbor a cyanophycin synthetase gene (cphA) and are able to synthesize CGP. Although CGP is generally insoluble at neutral pH as well as at physiological ionic strength (Allen et al. 1980), a water-soluble form of CGP was also synthesized in recombinant Escherichia coli and yeast (Ziegler et al. 2002; Steinle et al. 2009; 2010). CGP from cyanobacteria exhibits a molecular mass of 25-100 kDa (Simon 1976), while CGP from heterotrophic bacteria and recombinant strains is smaller and much less polydisperse (25-30 kDa) (Ziegler et al. 1998; Aboulmagd et al. 2001; Krehenbrink et al. 2002). CGP is resistant against hydrolytic cleavage by most proteases and arginase (Berg 2003) but is degraded by dedicated intracellular or extracellular cyanophycinases (CphB and CphE, respectively). The first reported CGPase, an intracellular CphB, was described by Gupta and Carr (1981) as a CGP-specific serine-type exopeptidase with an α-cleavage mechanism. Later, several aerobic and anaerobic bacteria capable of degrading CGP by extracellular CphEs were isolated. The extracellular CGPases CphEPa from Pseudomonas anguilliseptica BI, CphEBm from Bacillus megaterium BAC19, and CphEal from the facultatively anaerobic Pseudomonas alcaligenes DIP1 were subsequently purified and characterized (Obst et al. 2002; 2004; Sallam et al. 2009). Similar to CphB, all three CphEs were identified as CGP-specific serine-type proteases that produced Asp-Arg dipeptides as degradation products. Until recently, no practical applications for CGP itself or for the constituent dipeptides were known. In contrast, economically important applications are widely established for poly(aspartic acid) as a substitute for non-biodegradable polyacrylates (Schwamborn 1998) or as an additive in the paper, paint and oil industries (Joentgen et al. 2003). Biomedical applications have been also described for poly(aspartic acid) (Yokoyama et al. 1990; Leopold and Friend 1995). Besides being a potential natural source for poly(aspartic acid), biomedical applications for dipeptides derived from CGP were recently proposed (Sallam and Steinbüchel 2010); these applications were based on two scientific findings: i) the astonishingly widespread occurrence of CGP-degrading bacteria in the digestive tracts of various vertebrates which indicates that CGP is probably degradable in these habitats, and ii) the higher bioavailability of ingested dipeptides compared to free amino acids. Thus, CGP dipeptides were proposed as potential natural additives for the pharmaceutical and food industries (Sallam and Steinbüchel 2010). Several cyanobacterial cphA genes were heterologously expressed in E. coli, Corynebacterium glutamicum, Ralstonia eutropha, and Pseudomonas putida and were applied in the large scale production of CGP (Elbahloul et al 2005). CGP was also produced in tobacco and potato plants (Neumann et al. 2005) and in yeast (Steinle et al. 2009; 2010). To approach an economical large-scale production of CGP dipeptides, a technical process for their large scale degradation was developed (Sallam et al. 2009). The latter study describes a production process which depends on the use of CphEal from Pseudomonas alcaligenes DIP1 for CGP degradation and describes also the biochemical characteristics of this extracellular CGPase. However, this process still relied on the production of the enzyme from its native source. In the current study, we report on the heterologous expression of CphEal from P. alcaligenes DIP1 in E. coli strains. The aim of this work was to achieve a more efficient enzyme production than in Pseudomonas alcaligenes DIP1 and thereby enhance the overall productivity of the previously described process. The previously described SM medium containing 2 g/l citrate as carbon source (Sallam et al. 2009) was used for cultivating P. alcaligenes DIP1 for the production of CphEal. The clarity of this mineral salt medium allows an efficient monitoring of turbidity changes during cultivation. This in turn provides an indicator for the release of CphEal by observation of the degradation of the insoluble inducer (CGP). CGP-overlay agar plates were prepared using a sterile suspension of CGP in 1.2% (wt/vol) Bacto agar, which was poured as thin layers onto SM agar plates (with 1 g/l yeast extract) (Sallam and Steinbüchel 2008). To cultivate E. coli Top10 and E. coli BL21(DE3) for the heterologous production of CphEal, mineral salt medium (M9) containing 2% (vol/vol) glycerol or lysogeny broth (LB) medium (Sambrook et al. 1989) was used. Additionally, LB medium was also used for the maintenance of all used strains. The wild type P. alcaligenes DIP1 (DSM 21533; Sallam et al. 2009) was used as control for CphEal production and also as donor for the cphE al gene. E. coli strains Top10 and BL21(DE3) (Novagen) were used in combination with the plasmid vectors pBBR1MCS-4 (Kovach et al. 1995) and pET-23a(+) (Novagen) for the heterologous production of the enzyme. MiniPrep Kit and DNeasy kit (Qiagen) were used for the isolation of plasmid DNA and total genomic DNA, respectively. To construct the P. alcaligenes DIP1 DNA library, genomic DNA of P. alcaligenes DIP1 was digested with Pst I and ligated into the vector pBluescriptSK- (Stratagene). E. coli Mach1 (Invitrogen) was used as the library recipient. E. coli strain Top10 (Invitrogen) and plasmid pBBR1MCS-4 (Kovach et al. 1995) were used to subclone and sequence DNA fragments containing cphE al . Sequence analysis was performed by Seqlab (Göttingen, Germany). Nucleic acid sequence data and deduced amino acid sequences were analyzed using BLAST (Altschul et al. 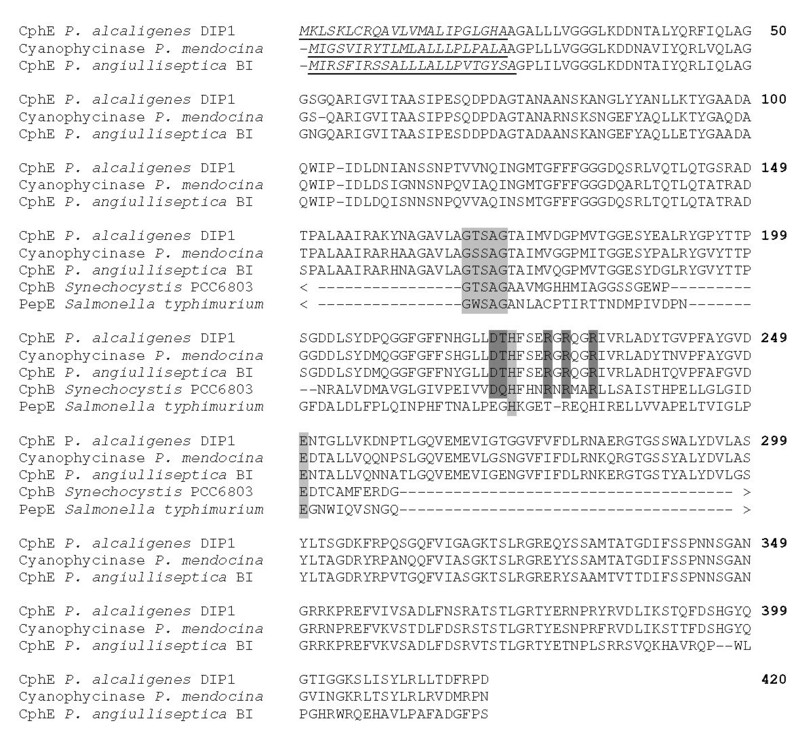 1990), Genamics Expression 1.1 and SignalP 3.0 (Bendtsen et al. 2004) server. The DNA sequence was aligned with published sequences from representative Pseudomonas species from the National Center for Biotechnology Information (NCBI) data base. After identification of the cphE sequence, oligonucleotide PCR primers were designed for the amplification of the gene and for the construction of plasmids pBBR1MCS-4::cphE al and pET-23a(+)::cphE al . Primer P1 (CCTTAGGATCC AATAATTGATCCACGCGTTTTCGC) was designed to bind 66 bp upstream of the cphE coding sequence and to introduce a Bam HI restriction site (underlined). Primer P2 (GGATGAATTC TTATTTCAGTCGGGACGGAAGTCGG) was chosen to bind directly downstream of the cphE stop codon and to introduce an Eco RI restriction site (underlined). Proteins in culture supernatant samples were concentrated (20-fold) and desalted using 10-kDa-molecular weight cut-off Vivaspin tubes (Vivascience AG, Hannover, Germany) or, for volumes of up to 500 ml, an Amicon chamber (Amicon, Beverly, MA) with 10-kDa cut-off membranes (Millipore Corporation, Bedford, MA). ChpEal was purified by the previously described substrate affinity procedure which depends on the strong affinity of the enzyme to CGP (Sallam et al. 2009). Active CphEal fractions were identified by the appearance of degradation halos around 3 μl aliquots spotted on CGP-overlay plates after 5 to 40 min incubation at 37°C. For quantitative determination of the enzyme in culture samples, the previously described photometric assay for CphEal was applied (Sallam et al. 2009). Bacterial growth and CGP degradation were monitored by measuring changes in turbidity in Erlenmeyer flasks, using a Klett photometer (Manostat Corporation, NY) or a photometer (600 nm wavelength; Ultropec 2000 III photometer, Pharmacia Biotech, Uppsala, Sweden). Sodium dodecyl sulfate-polyacrylamide gel electrophoresis (SDS-PAGE) was performed in 11.5% (wt/vol) gels according to the method of Laemmli (1970). Proteins and CGP were visualized by Coomassie blue staining (Weber and Osborn 1969). Free amino acids and dipeptides were detected by HPLC (Kontron Instruments, Neufahrn, Germany) after precolumn derivatization with ortho-phthaldialdehyde (OPA) as described before (Aboulmagd et al. 2000; Sallam and Steinbüchel 2008). CGP samples were subjected to acid hydrolysis (6 N HCl, 95°C, overnight) before amino acid analysis. Partial digestion of genomic DNA isolated from P. alcaligenes DIP1 with the restriction endonuclease Pst I yielded fragments with a broad size range that were subsequently ligated into the plasmid vector pBluescriptSK-. After transformation of the gene library into E. coli Mach1, about 3000 ampicillin-resistant clones were obtained and screened for their ability to degrade CGP on CGP-overlay agar plates. After 48 h of incubation at 37°C, a single colony was detected that was surrounded by a small degradation halo. The slow and weak degradation around the colonies of this clone may indicate poor gene expression or absence of active secretion of the enzyme. Sequence analysis of the plasmid from this clone revealed a 3.6-kbp genomic fragment. Alignment of the deduced amino acid sequence of CphE al with other known and predicted cyanophycinases and PepE. The potential signal peptides of the extracellular CGPases are underlined. Only the residues in the vicinity of the catalytic site are shown for CphB and PepE. The proposed catalytic residues (GXSXG, H and E) are shaded light gray. Residues proposed to be involved in substrate binding (Law et al. 2009) are shaded dark gray. For sequence alignment, the CLUSTAW was used. CphEal from P. alcaligenes DIP1; Cyanophycinase from P. mendocina; CphEpa from P. anguilliseptica BI; Cyanophycinase from Synechocystis PCC6803; PepE from Salmonella typhimurium. Numbering for the CphEal protein is given at the end of the line. Heterologous production of CphEal by E. coli strains Top10 and BL21(DE3) with plasmid vectors pBBR1MCS-4 and pET-23a(+). The fragment with cphE gene was cloned into the vector pBBR1MCS-4, and the enzyme expression in E. coli strain Top10 was confirmed on a CGP-overlay agar plate. The comparison between the two expression vectors (pBluescriptSK-::cphE(PstI) and pBBR1MCS-4::cphE(PstI)) showed much larger degradation halos with pBBR1MCS-4::cphE(PstI) after overnight incubation of CGP-overlay plates at 37°C (Figure 2). Degradation halo formation around CGPase producing E. coli strains on CGP-overlay agar plates. a: E. coli strain Top10 expressing CphEal from plasmid pBBR1MCS-4; b: E. coli strain Top10 expressing CphEal from plasmid pBluescriptSK-; c: E. coli strain BL21(DE3) expressing CphEal from plasmid pET-23a(+). To further improve the production of this cyanophycinase, the gene was amplified by PCR using primers P1 and P2, and the PCR product was cloned into the expression vector pET-23a(+) and expressed in E. coli strain BL21(DE3). 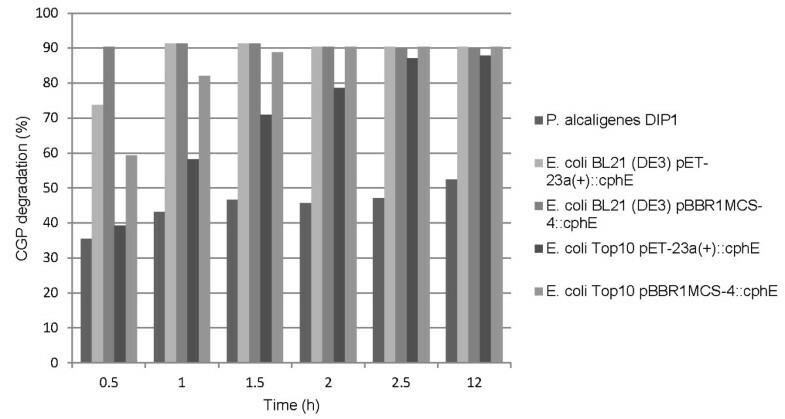 Subsequent incubation on CGP-overlay agar plates showed good enzyme expression (Figure 2) as in the case of plasmid pBBR1MCS-4::cphE(PstI) and E. coli strain Top10. The expression occurred in the absence of an inducer, suggesting that the native cphE promoter is functional in E. coli. To identify the optimal combination of strain, plasmid and culture media, the fragment was also cloned into pBBR1MCS-4, and both plasmids were transferred to both strains. The production of CphEal was assayed in complex LB medium and minimal M9 medium with 2% (vol/vol) glycerol. For increased enzyme production with pET-23a(+) in E. coli BL21(DE3) 0.6 mM IPTG was added to the media. The growth of all strains, including P. alcaligenes DIP1, on LB complex medium (Figure 3) was very similar. The P. alcaligenes DIP1 wild type and E. coli strain BL21(DE3) with either plasmid reached a final optical density of 550 Klett units, while E. coli strain Top10 grew to an optical density of 450 Klett units. In mineral salt medium (M9) containing 2% glycerol as a carbon source E. coli BL21(DE3) with either plasmid reached an optical density of about 500 Klett units after 14 h. Enzyme production from pET-23a(+) was induced after 9 h at a cell density of 300 Klett units. E. coli Top10 reached an optical density of only 150 Klett units after 14 h in M9 medium (Figure 4). Growth of the cyanophycinase producers in complex LB medium. The cells were grown in 100 ml medium in 1000-ml Erlenmeyer flasks. Growth of the cyanophycinase producers in minimal M9 medium. The cells were grown in 100 ml medium in 1000-ml Erlenmeyer flasks. The culture supernatants from all strains were concentrated 20-fold and tested for enzyme activity on CGP-overlay agar plates. Three microliters of the concentrated culture supernatants were spotted on plates and incubated for 1 h at 37°C (Figure 5). High CGPase activities were present in the culture supernatants of all strains grown in LB medium. Although the clear zones produced with plasmid pBBR1MCS-4::cphE al in LB appeared slightly smaller than with pET-23a(+)::cphE al for both strains, the activities were nevertheless high. The cyanophycinase activity produced by M9 cultures was much lower than that produced in LB medium. Although E. coli strain BL21(DE3) grew to similar cell densities in both cultures, the CGPase activities were much lower in M9 medium. E. coli Top10 pBBR1MCS-4::cphE al exhibited relatively high enzyme activities considering the low cell density achieved in M9 medium, but the overall activity was still much lower than that attained in LB medium. E. coli Top10 pET-23a(+)::cphE al , grown in M9 medium had almost no detectable enzyme activity. CGPase activity in culture supernatants from E. coli strains Top10 and BL21(DE3) expressing CphE al from the plasmids pBBR1MCS-4 and pET-23a(+), assayed on CGP-overlay agar plate. As the CGP-overlay agar assay can only give a crude estimation of enzyme activity, CGPase activity was also determined using a photometric assay (Figure 6) by measuring the decrease in OD600 of a CGP suspension (100 mg/l) caused by the addition of 10 μl crude culture supernatant to 5 ml of suspension. 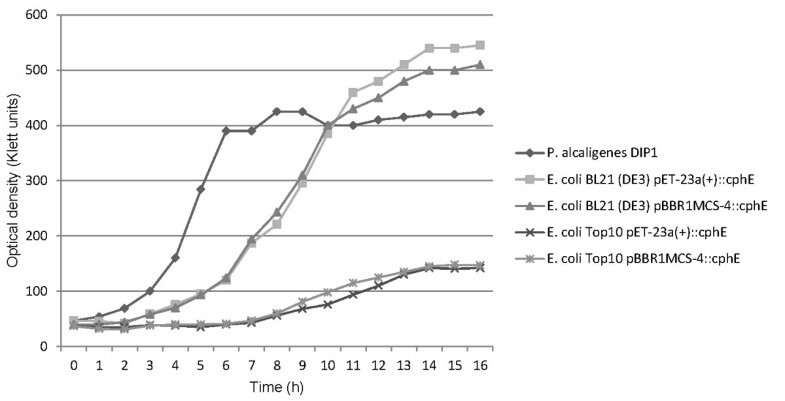 CphEal from E. coli BL21(DE3) pBBR1MCS-4::cphE al degraded about 90% of CGP within 30 min. Within the same time, CphEal from E. coli BL21(DE3) pET-23a(+)::cphE al degraded about 70% of CGP, CphEal from E. coli Top10 pBBR1MCS-4::cphE al about 60%, and CphEal from E. coli Top10 pET-23a(+) only about 35%. After 2.5 hours all heterologously produced enzymes had degraded 90% of CGP, while the amount of enzyme produced by the wild type had only degraded about 50% of CGP. CGP degradation by concentrated supernatant samples from cultures of P. alcaligenes DIP1, E. coli BL21(DE3) pET-23a(+):: cphE al , E. coli BL21(DE3) pBBR1MCS-4:: cphE al , E. coli Top10 pET-23a(+):: cphE al , E. coli Top10 (DE3) pBBR1MCS-4:: cphE al after induction. CGP degradation was determined photometrically and was used as an indicator of the CphEal concentration. Several extracellular cyanophycinases were identified in the last few years, and various applications have been proposed for the dipeptides produced by the action of these enzymes on CGP (Sallam and Steinbüchel 2010). A process for the production of dipeptides from CGP based on the cyanophycinase from P. alcaligenes strain DIP1 was described in previous studies (Sallam et al. 2009), but the identity of the cyanophycinase gene remained unknown. This study identified the cyanophycinase gene of this strain and optimized the production of the enzyme in recombinant E. coli strains. The molecular characterization of the cphE al gene revealed a DNA sequence that encodes a protein with a similarity of 91% to the extracellular CGPase (CphEpa) from P. anguilliseptica BI. Both enzymes exhibit almost identical molecular masses, with 45 kDa for CphEal from P. alcaligenes DIP1 and 43 kDa for CphEpa from P. anguilliseptica BI. By comparison, the intracellular CGPase from Synechocystis sp. PCC6803 (CphB) possesses an apparent molecular mass of only 27 kDa (Richter et al. 1999). The known or predicted extracellular CGPases were shown to be more closely related to each other than to any known CphB proteins. However, all CGPases shared common features. In CphEal from P. alcaligenes DIP1, the amino acids Ser171, His224 and Glu251 may constitute the catalytic active site residues responsible for the hydrolytic cleavage of the α-amide bonds in the polymer backbone. Accordingly, the catalytic mechanism is suggested to be that of a serine protease as previously proposed for intracellular CphB (Law et al. 2009). This finding is in good agreement with the confirmed sensitivity of CphEal toward serine protease inhibitors (Sallam et al. 2009). In contrast to the characteristic aspartic acid residue of most serine proteases, the catalytic triad is replaced by glutamic acid in CphEal. The same amino acid replacement was observed in the intracellular CGPase of Synechocystis sp. PCC6803 and other cyanobacteria (Richter et al. 1999) and in the predicted sequence of the extracellular cyanophycinase from P. anguilliseptica BI (Obst et al. 2006). The hypothetical cyanophycinase from Pseudomonas mendocina also showed the same replacement of Asp with Glu at this position. Intracellular CphB exhibit structural similarity to the aspartyl-dipeptidase PepE from Salmonella typhimurium (Carter and Miller 1984; Miller 1998; Law et al. 2009). In this structure, amino acid residues Gln101, Asp172, Gln173, Arg178, Arg180 and Arg183 were shown to be critical for CGPase activity and for the formation of a conserved binding pocket adjacent to the catalytic Ser132. With the exception of Gln173, these residues are also conserved in CphE (Gln136, Asp222, Arg228, Arg230 and Arg233). A threonine residue (Thr223) replaces Gln173 of CphB in CphEal. The proposed role of Gln173 is the formation of a hydrogen bond with the catalytic histidine residue, thereby promoting the correct orientation and tautomeric state of the imidazole group (Law et al. 2009). The hydroxyl group of Thr223 may similarly be involved in hydrogen bonding to the catalytic histidine His224 in CphE. The presence of a potential cleavable N-terminal secretion signal peptide in amino acid sequence deduced from cph E suggested that in P. alcaligenes DIP1 CphEal is exported to the periplasm via the Sec secretion system before it is further secreted into the extracellular medium. As the export of a protein from the periplasm to the extracellular space is usually achieved via Type II protein secretion systems, it is hypothesized that such a system may be responsible for the secretion of CphE in the parental strain. The observed cleavage of the signal peptide of recombinant CphEal produced in E. coli suggested that CphEal is also exported to at least the periplasm in E. coli. The extracellular CGP degradation observed in recombinant E. coli was somewhat surprising as E. coli lacks a functional Type II protein secretion system. However, the observed strong and rapid extracellular activity of CphE, in comparison to that shown by wild type, recommends the presence of an as yet unidentified secretion system rather than being due to leakage from the periplasm. CphE was active when expressed heterologously in E. coli Mach1 pBluescriptSK-::cphE al but was not efficiently produced in this system. Cloning the cphE al gene into the plasmid pBBR1MCS-4 and expressing the gene in E. coli Top10 or BL21(DE3) strongly increased extracellular enzyme production. Expression of the gene from plasmid pET-23a(+) also resulted in high levels of extracellular enzyme production. Although E. coli Top10 lacks the T7 polymerase required for efficient transcription from pET-23a(+), large amounts of enzyme were produced when this strain was grown in complex LB medium, suggesting that the native cphE promoter is recognized and induced in E. coli under the conditions present in complex growth medium, clearly indicating the need for artificial induction. Nevertheless, E. coli BL21(DE3) was found to be superior to E. coli Top10 in terms of total extracellular enzyme production with either plasmid. The highest levels of extracellular enzyme production were achieved with E. coli BL21(DE3) expressing cph E from pBBR1MCS-4 in LB medium. It has to be emphasized that all E. coli systems were superior to the wild type (P. alcaligenes DIP1) when grown in complex LB medium. Using M9 minimal medium with glycerol as a carbon source resulted in inferior levels of produced extracellular enzyme. However, the relatively low cost of mineral salt media makes these results interesting for a large scale production of CphEal. The expression of cphE in suitable E. coli strains greatly improved the amount of extracellular CGPase produced. This increase in productivity is an important step towards the industrial-scale production of dipeptides from CGP. We acknowledge support by Deutsche Forschungsgemeinschaft and Open Access Publication Fund of University of Muenster and we thank Dr. Yasser Elbahloul and M. Sc. Helge Jenßen for their useful hints during this work.